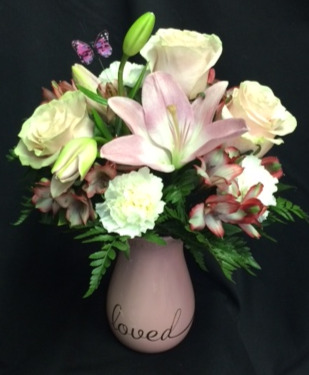 A professionally designed arrangement in a pink "loved" vase. 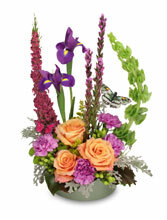 The flowers will be designer's choice of mostly pinks in observance of Breast Cancer Awareness month. Limited availability. X-long orchids accent explosions of tropical color. 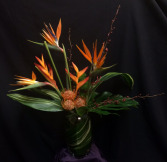 Birds of paradise, ginger(s), protea(s), and orchids will be chosen for a grand statement of fresh tropical flowers in a ovaled square vase worthy of reuse. We will try to make this arrangement exactly as show, and we will try to notify you of any substitutions. 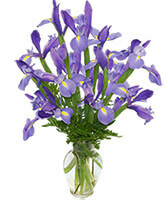 You are also welcome to call the shop and check availability of the products shown.